Gourmet food specials with overnight online home delivery. From gourmet steaks & meats, to franks & burgers, party snacks and appetizer specials. Receive free gifts in addition to cooking tips, recipes and more! Quiches Appetizers. Better than homemade and without all the work, these bite-sized gourmet quiches are so simple to serve. Enjoy our rich, buttery pastry shells made with our secret recipe and packed with the finest fresh veggies, cheeses and creams. A must for bridal shower, wedding and brunch menus.. Homemade quiche appetizers made from the highest grade ingredients available without all the fuss. Bite-sized gourmet quiche appetizers are so simple to serve. Enjoy our rich, buttery gourmet pastry shells made with our secret recipe pie crust and packed with the finest fresh veggies, spinach, mushrooms, roasted peppers, broccoli, cheddar cheeses and creams. Excellent for a bridal shower, wedding and brunch menus. Party appetizers ready in 10 minutes. 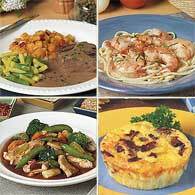 At Home Bistro we create great recipes - everything from soups and appetizers to complete meals and desserts. Then, using only the finest ingredients, we prepare everything, with skill, know-how, and artistry, just for you. We do all the time-consuming things. We shop and we chop. We mix, blend, and saut�. We grill the steaks, roast the lamb, poach the salmon. All you need to do is heat and serve our meals in about 10 minutes. It's that easy. Try our Quiche appetizers today! 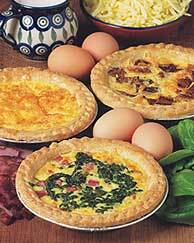 Quiche Appetizers Chef Prepared Gourmet Quiches - Appetizer made fresh daily. The same classic recipe as our Two Cheese Quiche but made with cob-smoked ham and garden spinach. 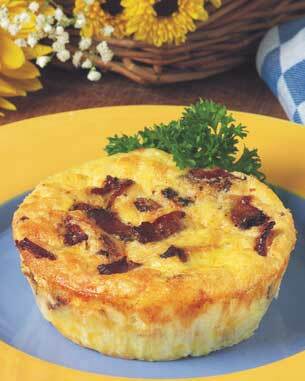 Peppered Bacon Quiche Chef Prepared Gourmet Quiches - Appetizer made fresh daily. Our classic quiche recipe accented with Vermont, applewood-smoked bacon rubbed with cracked black pepper for a distinctly spicy flavor. 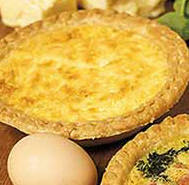 Two Cheese Quiche Appetizers Chef Prepared Gourmet Quiches - Appetizer made fresh daily. 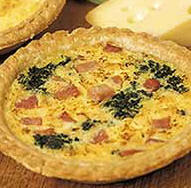 1 - The same classic recipe as our Two Cheese Quiche but made with cob-smoked ham and garden spinach. 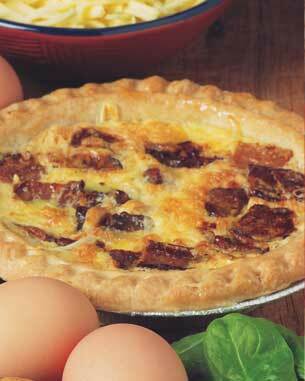 2 - A fluffy quiche made with mild Swiss, sharp cheddar and farm-fresh Vermont eggs all in a flaky golden crust. 3 - Peppered Bacon Quiche - Our classic quiche recipe accented with Vermont, apple wood - smoked bacon rubbed with cracked black pepper for a distinctly spicy flavor.